I've always had a fascination with food, especially when it comes to dietary differences around the world, so you can imagine my delight when I first heard of this book. Photographer Peter Menzel and writer Faith D'Aluisio visited with 30 family units in 24 countries all over the globe to observe their food-related habits. In each case, they inquired into the everyday diet of their hosts as well as the means of preservation and preparation at their disposal, then assembled the provisions typically required for one week, posing both people and food together for a "family photo." The occasional recipe is included, a generous gift from interviewees to their guests. Predictably, there are disparities between the family groups, based on their respective geographical, cultural and economic situations. I knew this, yet seeing the evidence in full colour was still a shock; the photos illustrate, with remarkable eloquence, just how marked these differences can be. 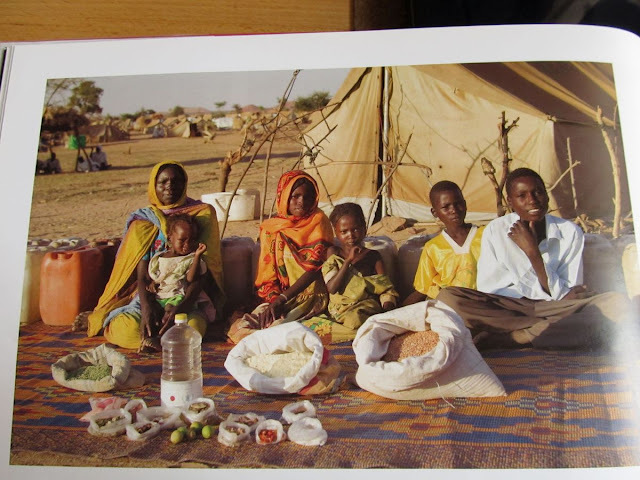 This is the Aboubakar family, originally from Darfur (Sudan) and photographed in the Breidjing refugee camp in Chad; the food in front of them is intended for six people for one week. 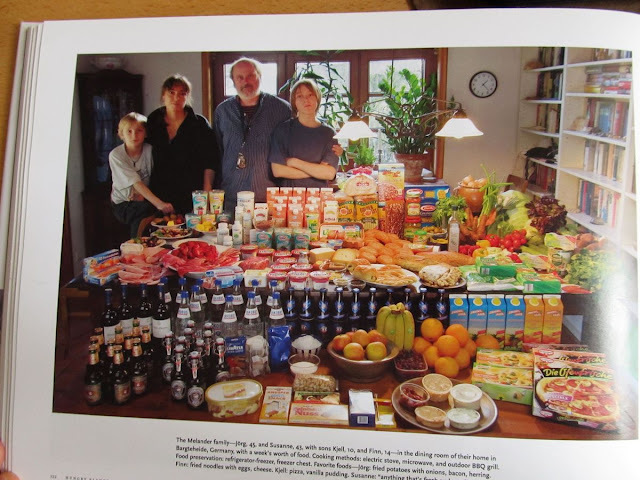 And here are the four members of the Melander family from Germany, standing behind their groceries for the same period. How could we even begin to draw comparisons? As fascinating as I found it to learn about shared meals and persisting traditions, my enjoyment was far from unmitigated. I shifted between heartbreak at the quasi impossibility for some human beings to obtain enough nourishment to remain alive for one more day, and nausea at the sight of the appalling excesses of others. This eye-opening book was published in 2005. No doubt, if such a project were to be undertaken today, these disproportion would appear even more glaringly.